When March rolls around in Austin, many things come to mind, Spring Break, SXSW, warm weather, but one thing that might not be at the forefront of your mind is the Austin Rodeo. Held every year out at the Travis County Expo Center, Rodeo Austin is a great way to get your "country fix" in. 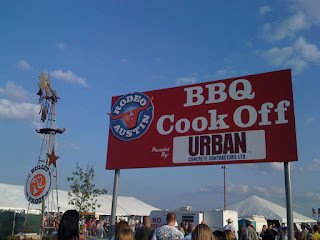 This year, I learned yet another reason to love the Rodeo...the annual BBQ Cook-Off! 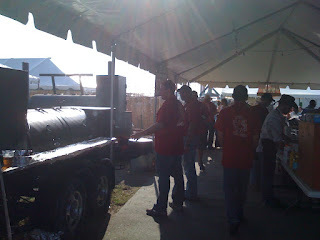 Held during one weekend, the cook-off brings in over 50 teams all competing for the top prize. The best part about it, is that everything is free after your admission to the fairgrounds. Donations are requested and at some stops demanded, but hey it's all for charity. This year, I stopped by a few tents and sampled the goods. 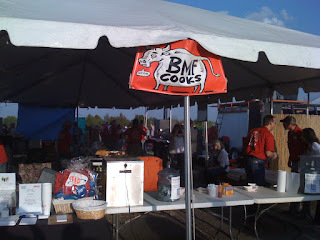 The winner is my book was a group called "BMF Cooks" (don't ask what it stands for). 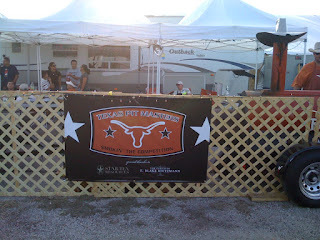 At this tent I sampled brisket, pork ribs, chicken, pulled pork...all of which were very good. I especially liked both cuts of the pork. See pictures of BMF's two portable pits, "Jack Bauer" and "Chuck Norris"! They served up some kick a** BBQ, so these were rightly named! 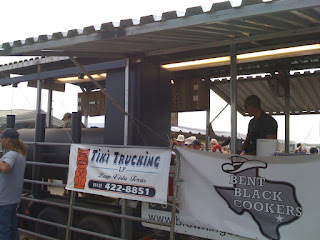 As I wondered I visited a few other tents; Texas Pit Masters had phenomenal brisket and ribs, and Bent Black Cookers had decent ribs but very fatty brisket (they also demanded a donation, that kinda ruins the experience and leaves you with a bad taste in your mouth). All in all though, the day was great. You could literally spend all day and night sampling BBQ from teams all across the state. Check out the pictures and plan on going out to the Cook-Off next year! Man Up makes its first visit to Opie's in 2009. And, coming up: The review of our first trip to Rudy's this year. What side item(s) do you like to eat with your BBQ (if any)? You might be wondering why we made such a quick return to The Salt Lick. Well, my brother, Scott, was in town to visit me and wanted to try a BBQ place he hadn’t been to (having already been to Rudy’s and Opie’s). Salt Lick isn’t too far, and everyone else in my family has been, so it seemed like a good choice. So, our party of 9 met at the restaurant and got seated right away. In retrospect, beating the lunch rush maybe wasn’t the best way to capture the full experience, since we didn’t get to sit outside with drinks and listen to live music. Nonetheless, we had a good meal and a great time. 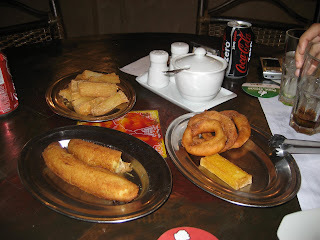 Among the 9 of us, we had a little bit of pretty much everything on the menu. As always, I found the chicken to be fantastic. The sauce is second-to-none. Like me, Scott rates Opie’s higher than TSL, but he had a great experience overall. I'll be posting a new review on Monday. In the meantime, enjoy this Food & Wine piece from last April on BBQ in the Hill County. My Texas-BBQ comrade over at Full Custom Gospel BBQ hit up the BBQ Crash Course this week at South by Southwest. Here's his review. In case you haven't noticed, I've got a couple of Urbanspoon links on the right side of the page. Urbanspoon is a great place to read about and review restaurants. 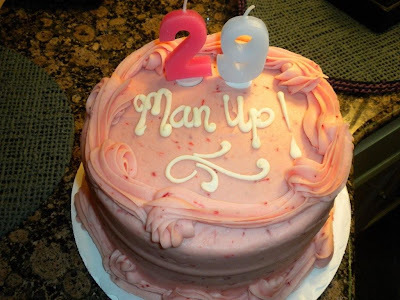 QOTD: Whose birthday cake today said "Man Up!"??? Knowing I don't eat cake, my sister got the cake she wanted. Well played. I’ve been meaning for a while to make a trip down to San Antonio for a meal at The Smokehouse, and we finally got a group together and made it happen. Six of us made the 80-mile trip down I-35 for a Saturday lunch at the no-frills joint on the East side of town that made Texas Monthly’s Top 50 list for 2008. Russell, Brad, Bo, and I manned up on the Super Family Order (“1 lb Brisket, 1 lb Pork Ribs, 1 lb Sausage, 1 lb Meat of Your Choice, 2 Quarts of Sides, Bread, Pickles, Onions, and BBQ Sauce”). We chose chicken for our fourth meat, and the three of them each had a beef rib, as well. (View the menu.) All of the meats had a nice, smoky flavor, but everything was overcooked and dry. I didn’t try the sides. The owner was gracious enough to let me in the back to take pictures of the meats in the pits. For the company alone, every Man Up trip is worth it, but I’d say it’s unlikely we’ll make a return trip to The Smokehouse. Here’s a review of two places I checked out while in Brazil. 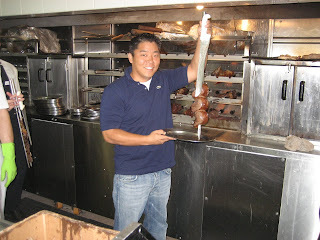 All the pics are from Na Brasa, the 2nd place I hit up. We all have heard about these Brazilian steakhouses – Fogo De Chao, Texas de Brazil, Churrascaria Plataforma the list goes on and on…Churrascaria as it is called in Portuguese. This is a style of Gauchos of Argentina/Uruguay and the southern part of Brazil! 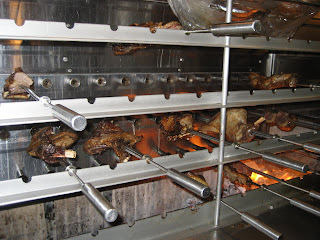 The first place I went to was called: Churrascaria Roda De Carreta - some people refer to it as 35 C.T.G. I went here for lunch with my co-workers. This was an older looking building; reminded me of a Texas dancehall or something…wood everywhere, and a wooden dance floor; apparently they do gaucho shows in the evening…missed out on that. Like any good churrascaria, they have a salad bar – very simple salad bar here folks… I barely put any of it on my plate. I sat down and was ready for the meat! I had a lot of what they call picanha – which is actually rump steak. The part of the meat right before the tail. 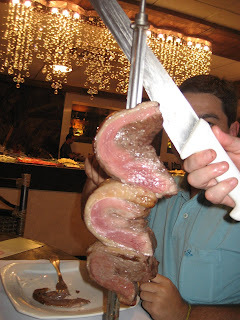 This is the picture every Brazilian BBQ place shows as well; the 3 beef chunks that look like a kidney. Anyways this stuff rocks! Honestly some things I had no idea what part of the meat it was; I just knew it was beef, pork, chicken, sausage or lamb. It was all tasty. My favorites were the filet mignon chunks infused w/ garlic! So good!! My appetite definitely wasn’t there, which only resulted in not eating a lot. But I tried my best folks…Upon entering this place, you can tell it’s nicer; the layout is fancier…they have cloth on the tables unlike the other place. People were dressed up, and the salad bar… yea you just look at the salad bar and knew…this is definitely more upscale. Again, didn’t spend too much time at the salad bar. Picked up some palm hearts, capers, some bits of arugula and cheese. 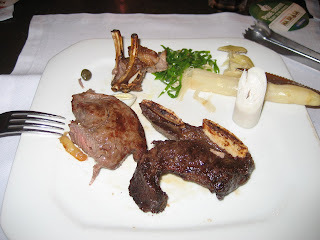 Here, I definitely had more of a selection: Beef, chicken, sausage, pork, lamb, wild boar. I must say the wild boar was awesome: 9.5; beef: 9; didn’t eat chicken here either but did have the hearts: 5; definitely had a stronger flavor than 35; lamb was excellent: 9.4. The people here were gracious enough to show me the kitchen and took pictures of me, it was a sweet setup! BBQ in Brazil gotta love it! I’m now a fan of Brazilian BBQ even more after seeing the culture and the roots and origins of this style of BBQ I just wish the prices reflect that of Brazil! I won’t tell you guys how much my meal there was….